Welcome to TestPrep-Online's free ACCUPLACER practice page. Try our free practice test questions with answers and explanations. Our free, printable PDF offers questions simulating the style of the College Board ACCUPLACER test. I got the ACCUPLACER pack. I found TestPrep-Online’s preparation pack very helpful. The questions and study guides are great. I found that the explanations and solving tips really helped me to learn the material and improve my score. I used the Wonderlic BST pack. This practice really helped me to pass my test. I used the GMAT prep. It's almost standing in one line with formal GMAT simulations. I got the TEAS tests. I found this website to be very helpful. The practice tests are almost identical to the real test; they have helped me a lot in studying. I got the Family Membership. It was excellent! We used the CogAT practice pack. The questions in this study pack were very similar in style to what appeared on the actual test. I would definitely recommend this product to other parents. What Is the ACCUPLACER Test? The ACCUPLACER is an untimed, computerized test consisting of multiple-choice math and English questions. It is used as both an admissions exam and a college placement test. You can find example questions for five of the most common sections of the test below. The Math section of the ACCUPLACER consists of Arithmetic, Elementary Algebra, and College-Level Math. Below are sample questions for each section. You can also view sample questions for both Math and English in our 42-page ACCUPLACER PDF question booklet. The ACCUPLACER Arithmetic Test consists of 17 questions and focuses on basic mathematical operations: addition, subtraction, multiplication, and division. The Arithmetic section evaluates your knowledge in whole numbers, fractions, decimals, percentages, and problem-solving. Robert is writing a book. In the beginning, he wrote at a rate of ten pages per day. After some time, he got uninspired and stopped writing for a while. Then he began to write again at a rate of twenty pages per day. Which of the following graphs represents the writer's rate as a function of time? Note that the rate of each of these three times is constant. 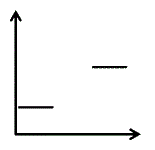 It is stated in the question that the graph represents the writer's rate as a function of time. 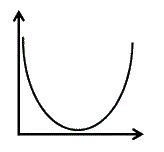 Hence, time is the x axis and rate is the y axis. 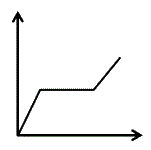 A constant rate will be represented by a parallel line to the x axis, i.e. zero slope. Answer (C) is the only accurate graph, having a zero slope for the first and third time zone, with the third y values greater than the first. Therefore, the correct answer is (C). 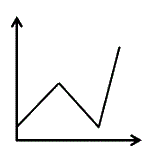 Answer (A) is incorrect as it represents an increasing reduction of the rate and then an increasing growth of the rate. Answer (B) is incorrect as it represents rate with increasing or decreasing factors. If you chose answer (D), you probably assumed that the x axis is time and the y axis is number of written pages. The ACCUPLACER Elementary Algebra Test consists of 12 questions and assesses how well you can perform basic operations in algebra. This section evaluates you in three primary areas: integers and rational numbers, algebraic expressions; and equations, inequalities, and verbal problems. Nancy is planning a ring-shaped pool for a new hotel in Florida. The outer diameter of the pool is 100 feet. 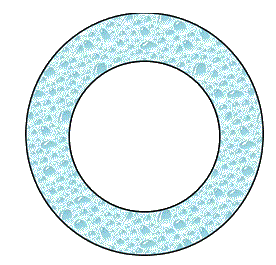 If the pool has an area of square ft., which of the following is its inner diameter (the diameter of the dry area)? The outer diameter is 100 feet. 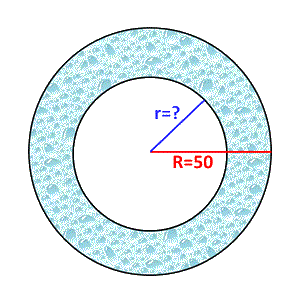 Therefore, the radius of the entire shape is 50. 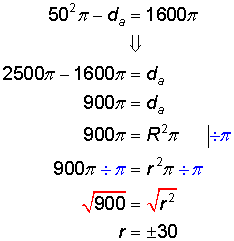 The length of a radius can be only positive; therefore, r = 30.
d = 2r = 2 x 30 = 60. The inner diameter is 60 feet. Therefore, the correct answer is (A). The ACCUPLACER College-Level Math Test consists of 20 questions that assess your ability to solve problems related to college-level math material. This section covers five primary areas: algebraic operations, equations and inequalities, coordinate geometry, applications, and functions and trigonometry. A certain language uses only five letters. How many three-lettered words consisting of three different letters can you create in this language? In this problem, you need to calculate the number of different combinations. For the first letter of the word, there are five options. For the second letter, there are four options (i.e. the remaining letters except the one used in the first letter placement). For the third letter, there are three options (i.e. the remaining letters except the ones used in the first and second letter placements). There are 60 different combinations for three-lettered words consisting of three different letters in this language. Therefore, the correct answer is (D). The ACCUPLACER Sentence Skills Test consists of 20 questions and assesses your understanding of English grammar principles and sentence structure. You will encounter two types of questions. The first requires you to identify the correct word order and grammatical form of the words in a given sentence. The second asks you to correct the given sentence by choosing the best substitute. Because it is sung as a Christmas carol, "Jingle Bells" was originally written for Thanksgiving. While the original sentence correctly uses the subordinate clause (“Because it is sung…. ), it has a logic error, as it suggests that the reason "Jingle Bells" was written for Thanksgiving was that it is sung as a Christmas carol. Answer (C) repeats the error. Answer (B) is incorrect because it is missing a semi-colon before the word “however,” thus creating a run-on sentence. Answer (D) is correct because it uses the word “although,” which corrects the logic error. The ACCUPLACER Reading Comprehension Test consists of 20 questions that measure your ability to read a text, understand it, answer inferential questions, identify the main idea, and draw conclusions. You will encounter two types of questions. The first type of question requires you to read a text and answer questions. The second type of question asks you to identify the relationship between two sentences. Guys and Dolls, which premiered on Broadway in 1950, is a musical based on two short stories by Damon Runyon. It ran for 1,200 performances and won the Tony Award for Best Musical. The musical was adapted in 1955 into a film. The passage discusses Guys and Dolls, a Broadway musical that premiered in 1950. Answer (A) is incorrect because the passage does not mention whether the movie adaptation won any awards. Answer (B) is incorrect because there is no mention of a book in the passage; the author merely states that the musical is based on two short stories. Answer (C) is incorrect because Guys and Dolls is a musical, not a drama. You can also download the free TestPrep-Online ACCUPLACER Sample Questions PDF, a 42-page booklet of free sample questions and explanations on each topic. You can also upgrade to a complete preparation pack with our comprehensive ACCUPLACER Premium Pack. How Do You Pass the ACCUPLACER? Most colleges use a placement exam—as a universal measure to ensure students are placed in the correct class. Although you can’t technically pass or fail an ACCUPLACER exam, your score will determine which level of math or English course you place into. If you are taking the ACCUPLACER as an admissions exam, you must get a certain minimum score to enroll in your desired program. This minimum score will vary from institution to institution. Why Should I Prepare for the ACCUPLACER? Without good preparation for the ACCUPLACER exam, you may find yourself in a class that is below your skill level and which costs you extra to take. Often, the lower level courses cover material you will have already learned in high school. Thus, preparation is key to avoiding remedial courses and to saving time and money. For enrollment in special programs, you may need a particular score on the ACCUPLACER. Preparation will help you excel and ensure your spot in your chosen program. TestPrep-Online's team of experts have created online practice tests that simulate the format of the ACCUPLACER test, allowing you to practice with up-to-date materials before your actual exam. Whether you are taking the ACCUPLACER as an admissions or placement exam, our resources have you covered. ACCUPLACER® and WritePlacer® are trademarks and property of COLLEGE BOARD. The trademark holder is not affiliated with TestPrep-Online or this website. 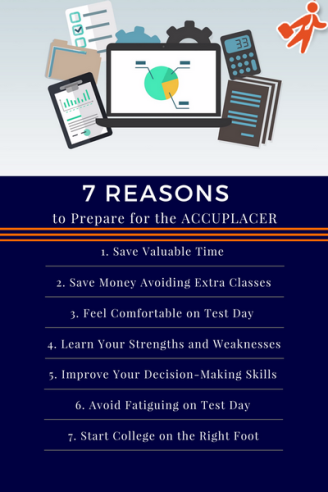 Start prepping for the ACCUPLACER today!